An 18-year-old, otherwise healthy, male presented with 1-month history of patchy, asymptomatic hair loss over the scalp. 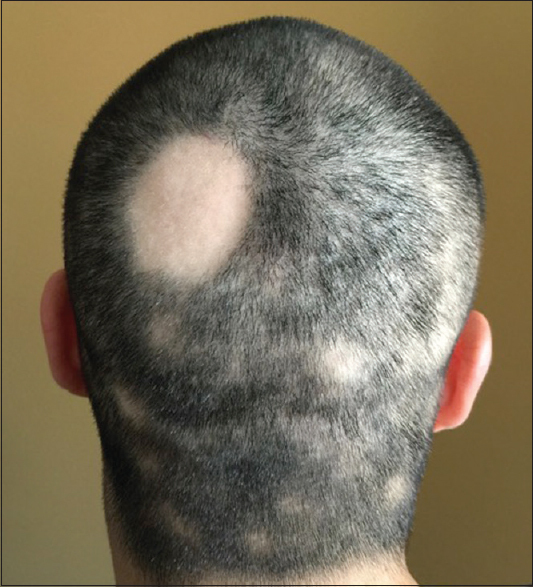 Dermatological examination showed well-defined, round patches of nonscarring alopecia on his parietal, temporal, and occipital area which were consistent with alopecia areata (AA) [Figure 1]. General physical examination was normal with no evidence of lymphadenopathy or hepatosplenomegaly. His medical and family histories were insignificant for autoimmune diseases and atopy. Before treatment, laboratory tests done to exclude coexisting autoimmune diseases were either negative or normal, including levels of thyroid hormones, thyroid autoantibodies, blood fasting glucose, Vitamin B12, and antinuclear antibodies. A complete blood count was also normal apart from a platelet count of 10000/mm 3. There was no history of bleeding except for occasional ecchymoses secondary to trauma [Figure 2]. The patient was referred to hematology with a presumptive diagnosis of immune thrombocytopenic purpura (ITP) concurrent with AA. A peripheral blood smears revealed decreased number of platelets (1–2 per field) and normal-appearing leukocytes, erythrocytes, confirming the diagnosis of ITP. Treatment with methylprednisolone 0.8 mg/kg/day led to increase of platelet count to 265,000/mm 3 and almost complete growth of hair within 2 weeks. The patient is still followed up. AA is well-known to be associated with autoimmune conditions such as vitiligo and thyroid disease; however, the association of AA and ITP has been reported in only two cases previously., Levin et al. reported a 2-year-old female with simultaneous onset of ITP and AA which were successfully treated with systemic corticosteroids and intravenous immunoglobulin. More recently, a 7-year-old female with spontaneous occurrence and resolution of ITP and AA was reported. In both patients, ITP presented with generalized petechiae and easy bruising; there were no symptoms of bleeding as in our patient. In addition, Tosti et al. reported a patient with "autoimmune platelet disease" in their long-term follow-up study of AA patients; however, since the follow-up was performed by phone, no detail was given regarding the onset or diagnosis of platelet disease. In conclusion, herein, we present a rare or maybe underreported, association of AA and ITP. 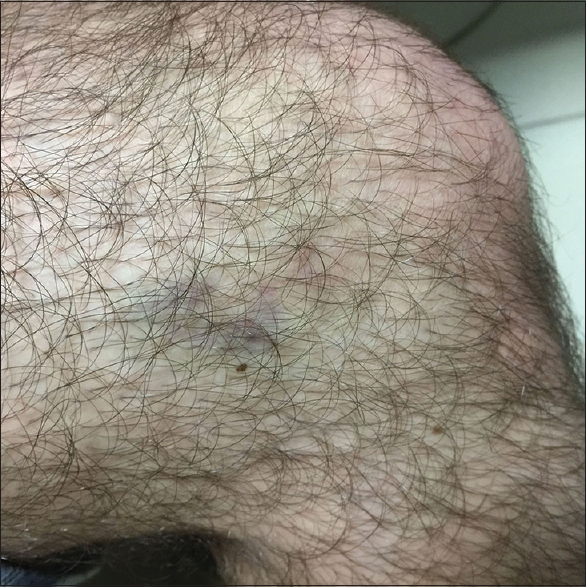 Although it is not possible to draw definite conclusions from single case reports, we think that history of bleeding or easy bruising should be carefully taken in AA patients and evaluated with a complete blood test when history indicates. Further studies and description of additional cases are needed to elucidate the common pathways involved in AA and ITP. Levin RM, Travis SF, Heymann WR. Simultaneous onset of alopecia areata and idiopathic thrombocytopenic purpura: A potential association? Pediatr Dermatol 1999;16:31-4. Cohn SM, Buchanan GR. Immune thrombocytopenia and alopecia areata: Spontaneous occurrence and resolution in the same patient. Pediatr Blood Cancer 2014;61:2110-1. Cines DB, Cuker A, Semple JW. Pathogenesis of immune thrombocytopenia. Presse Med 2014;43 (4 Pt 2):e49-59.